I responded immediately: yes. That sounded exactly like the kind of thing I would like to do this summer. Later, Annalise told the five of us who signed on to help with the project that, upon hearing her idea, we had all reacted with instant excitement and enthusiasm, even before hearing any of the details. And excited we were, when Rayos de Canción (Rays of Music - what we came to name our outreach group) departed JFK International Airport at 7 in the morning on May 21st, with our instruments (and Annalise's pointe shoes!) in hand. Let’s rewind a bit. Before we got to the actual trip, the group had a lot of preparations to make. There were six of us altogether: Annalise Thompson, a dancer; violist Caterina Longhi; flutist Matt Wright; percussionist Ian Sullivan; bassoonist Midori Samson; and myself, Caeli Smith, a violinist. We applied for and received a $2,500 seed grant from Juilliard that helped us get started, but we needed to raise the rest ourselves. We found a fiscal sponsor to help us handle the tax-exempt donations we would raise. We had bake sales at Juilliard. We gave b enefit recitals in our hometowns and in New York City, and we all wrote many fundraising letters to our networks of friends and family. I gave a benefit recital in Philadelphia, my hometown, over spring break, and raised $2,400. Between the six of us, we were lucky enough to raise a total of $11,137 to finance our trip. Meanwhile, in the midst of our busy Spring semester, we sought to prepare ourselves mentally for the task ahead. 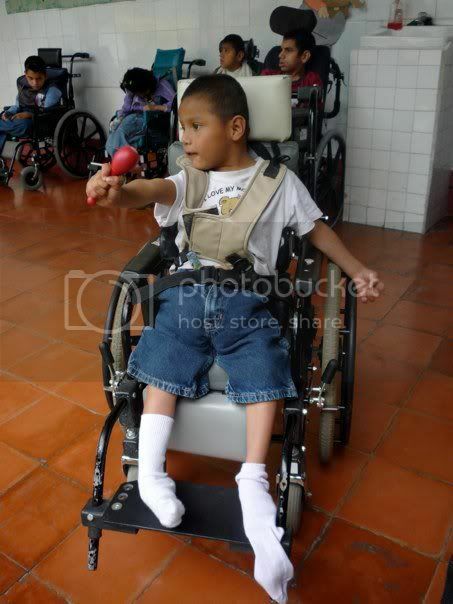 We developed an outline of what we would be doing: we would travel to Antigua, Guatemala for ten days, and volunteer at a hospital where most of the long-term patients had cerebral palsy. 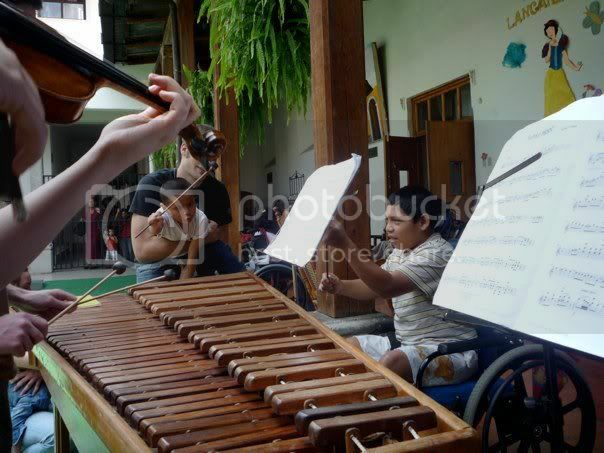 The facility does not offer music or movement therapy as a part of their care – in fact, most of the patients have never experienced classical music, or live music, at all. Our goal, then, would be to introduce music, in its most basic and accessible form, to the facility, in the hopes that the staff would elect to seek it out as a more permanent form of supplemental care. We did everything we could think of to prepare in the months before our trip, but even as we were jetting off to Central America, I could tell that I wasn’t the only one in the group who was nervous. This was the first project of its kind that any of us had attempted; we were doing it on our own, without teachers or mentors to guide us; and it would be our first time living and working together closely as a group. We knew what we hoped to accomplish while we were there, but none of us had a clear idea of what would actually take place. Since we were doing this project without the help or supervision of any adults, it was scary, and a big leap for us. We were venturing into an unknown place without knowledge of the responses our efforts might receive. I decided to think of it like an experiment, with a hypothesis, a test, and an analysis. We hoped and assumed that they would enjoy the music. But how were the patients going to react? How about the staff? Would they like it? Would what we were doing even matter? We knew that we would have a lot to figure out as we went along, we would need to make constant, deft adjustments—and we hoped we wouldn’t make too many mistakes. In the end, we would analyze our experience, and draw conclusions about whether or not our efforts had made a difference. We flew from New York to Miami, and then to Guatemala City, the capital of Guatemala. We rode in a van for about an hour from the airport to San Juan del Obispo, the small village where we stayed for the first half of the trip, in a 500-year-old adobe convent with walled gardens and fountains. The convent was so serene that it felt as if talking in a whisper were a requirement. 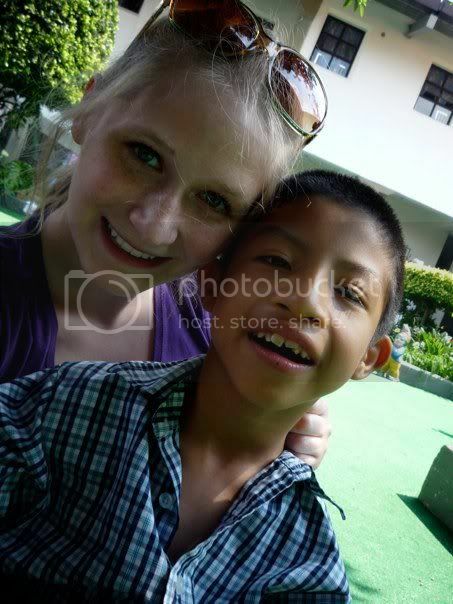 Except for Annalise, who is fluent, we spoke no Spanish and the nuns spoke no English. They were wonderful, hospitable hosts, who allowed us to stay in their beautiful home for free, to support our project. On one of our nights there, we gave a performance for the nuns and a few of their guests. On our first day of work, we walked into Obras Sociales del Hermano Pedro (the Social Works of Brother Pedro – the name of the hospital, located in Antigua). The hospital has wards for infants, “grannies” (as the woman who was in charge of volunteers called the elderly female inpatients), men, women who required special psychiatric attention, and children. The term “children” refers only to their size – the age of the patients in the children's ward ranges from four to over thirty. This was where we spent most of our time, and we quickly grew very attached to the patients there. 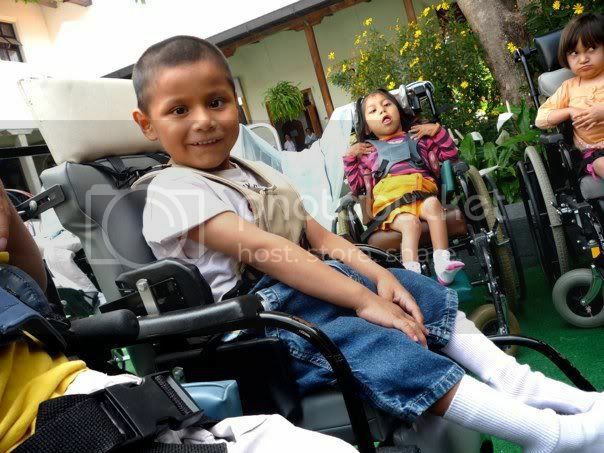 All of the patients in the children's ward were in wheelchairs; all had been born with cerebral palsy. When we entered the ward, they were lined up outside, against the wall, facing a sunlit play area covered in artificial grass. There were a couple of planters with live flowers, a wheelchair swing, physical therapy mats, and a rusty, terrifying toy – a creaky, sort of merry-go-round swing that I didn’t go near. We were given no instructions for playing with the patients, which, as an American used to a rule-bound culture, I found very unsettling. We were hesitant at first, not sure what we were allowed to do. Luckily, there were other volunteers there – mostly college students from the U.S., as well as a family of eleven American siblings who had recently moved to Antigua with their missionary parents. The other volunteers were enthusiastic and helpful, and we quickly caught on. Other than Annalise, we only knew a few phrases of Spanish, yet we connected with the patients easily. Many of them were social and affectionate, and eager to play. They loved games like peek-a-boo and “Red Light Green Light”, and they loved it when we tossed them colorful plastic balls. After getting acquainted with the kids, we unpacked our instruments. Ours was a peculiar combination, but it worked out fantastically because, with a violin, viola, flute, and bassoon, we were able to play string quartet arrangements, and music for many smaller ensemble combinations. The careworn marimba, which we rented from a local music store, was great for solo Bach, and as a duet partner. Along with the volunteers, there were several nurses for each ward who fed and cleaned the patients. The nurses seemed exasperated by our presence, and wary of our music (except for one, who said she had been enjoying it and thanked us). The nurses have tough jobs, and didn’t seem to appreciate anyone else butting in. A fellow volunteer told us that the only requirement for being hired as a nurse at the facility was an 8th grade graduation. The nurses, though they worked hard, were apparently ill-educated about the care of their patients. We often saw them feeding the kids with bottles while they were lying down. The same volunteer, a graduate student from a university in New York who had majored in swallowing and speech patterns, told us that feeding the patients this way caused the fluid to get into their lungs, which ended in terrible congestion and not so infrequent trips to the E.R. at the other end of the hospital. We volunteered at the hospital in the mornings, from nine to one. On some afternoons we visited nursing homes in Antigua. At first we were intimidated to enter huge rooms full of a hundred wrinkly Guatemalans, whom we couldn’t speak to and who couldn’t understand us. But any barrier we felt quickly dissolved. We launched into Ave Maria, and received a standing ovation – within the first few measures! The appreciation we felt from the audience felt more sincere for me than any performance I’ve given in a concert hall anywhere in the U.S. We enjoyed applause long after we finished each piece, and one audience member’s determination to hear the music had him angrily shushing his neighbors if they were to talk casually during the music. One morning at the hospital, I was playing with a 13-year-old girl named Arianna. She is less than three feet tall and can’t walk, so I was cradling her in my arms and rocking her back and forth. Caterina and Ian jumped into the duet “Swingin’ Thingamajig” by Jeremy Cohen (the piece was originally written for two violinists, but we got creative with our instrumentation!) I knew that Arianna had a sweet disposition and loved to have fun, and earlier I had seen her smiling when we played games that she liked. As Catie and Ian played, Arianna, who can’t speak, broke out into a wide smile, the strongest reaction I had ever seen from her. I stood up and brought her closer to the source of the music, and her smile grew. Witnessing her reaction the music was one of the most fulfilling experiences of our trip. When she was returned to her crib at the end of the day, she dissolved into sobs and couldn’t be consoled before we left. The kids grew accustomed to our presence and our music. “Donde está la música?” one little boy, Maynor, would ask us when we arrived each morning. He would repeat the sentence several times, with a mischievous smile, until our instruments appeared and we began to play. However, performing for the kids was only half of our goal for introducing them to music. We wanted to make the experience as interactive for them as possible. We brought with us around 75 musical instrument toys – egg shakers, plastic maracas, rhythm sticks, even a toy triangle. The toys were snatched up by the more mobile patients. One boy, a 16 year old whose face usually rested in a dull stare, grabbed the red plastic maraca that was offered to him, and continued to shake it for hours – HOURS, as we played. Now that’s the focus and stamina required to be a good musician! 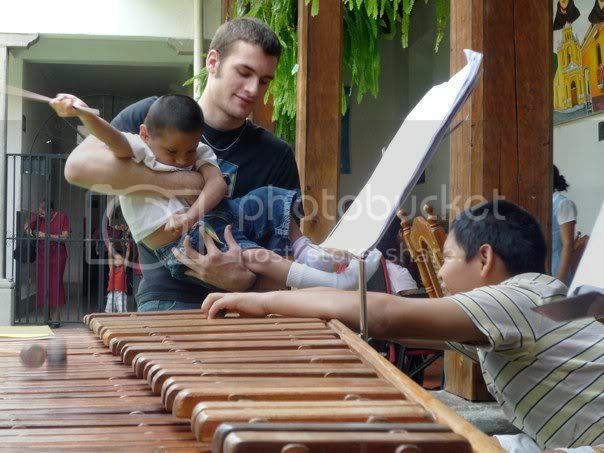 The marimba was an object of fascination for many of the patients, and a few wanted to try it out themselves. Some struck at it while seated in their wheelchairs, others we held in the air while tried their hand with the mallets from above. It was almost impossible for us to break away from the hospital at the end of our volunteer hours, and even harder to say goodbye on our last day. We knew that, although we were leaving behind our stock of musical toys, we knew it was unlikely that the nurses would ever allow the children unpack them for the children to play. The music we had made would exist only in their memories—if they could remember it—until we returned again. Our departure was bittersweet, but we felt successful in our attempts, and we are excited to maintain our developing relationship with the hospital. Our new goal is to turn the project into an annual trip of Juilliard students who will continue giving and receiving love, and a love for music, to our new friends in Guatemala. If we can reach this goal, the next step is to find a way to make music a continual, year-long presence in their lives. Caeli, Bravo! and Congratulations! on a beautifully written article about an important musical experience and life experience. I think your long term goal for an ongoing mission for Juilliard students in Guatemala is a worthy one and eminently doable. Welcome to the growing community of musicians who are finding new ways to use music to help people at home and around the world! I'm so impressed with this accomplishment, the way all of you came up with this idea and followed through in such a thorough way. I do believe that the life of a successful musicians requires the ability to make these kinds of ideas become real, which means knowing how to raise funds, apply for grants, make logistical arrangements, etc. Congratulations, and thank you for sharing your experience in such an elegant way! This is exactly what music is all about. Hats off to you all! What a lovely blog, and an awesome idea . . . Thanks for sharing! What an awesome experience. Congratulations, and thanks for sharing. Loved the article. My career involved working with children with special needs and your experience sounds marvelous. Luckily, my school system employs marvelous music therapists that do much of what you described. Kudos to you and your friends. We need more people like you in this world! Wow! Sounds great! Well done!!!!!! !